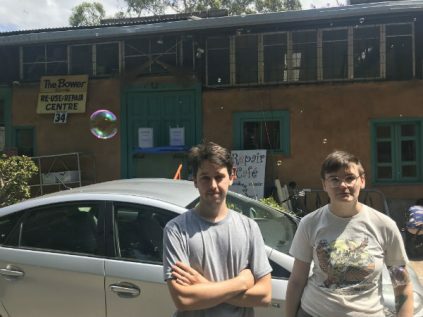 The Bower Reuse and Repair Centre in Marrickville has been locked out without notice from its premises by the Addison Road Community Centre Organisation (ARCCO) due to an alleged breach of the conditions of its lease. Customers and staff of the Bower arrived at 8:30am on Monday morning to find that the doors of Hut 34 had been locked by ARCCO, which has leased the site to the Bower since 1998. An eviction notice was pinned to the door declaring “trespassers will be prosecuted”.ARCCO released a statement saying that the “difficult decision” to lock down the premises was taken after two years of ongoing disputes with the Bower. The Bower’s General Manager, Guido Verbist said that the eviction was given due to a compliance order issued by Inner West Council regarding two 10-year-old buildings which had been constructed at the site without the former Marrickville Council’s approval. “When we arrived here, notes were already on the door and that was it…we were out,” Mr Verbist said. “We just celebrated our 20-year anniversary…and now we might be done. “They claim that we have built or breached the lease by adding additions to the building, which we dispute because they were there before the lease commenced in November 2011, but they don’t agree. Mr Verbist said he and his colleagues had been in contact with Council about the breaches and had planned to voluntarily demolish the illegal buildings. “Even the Mayor, Darcy Byrne has already said in writing that the compliance order is not meant to evict people but is to help solve the problem,” he said. Mr Verbist said there had been several disputes between Bower and ARCCO in the lead up to the eviction, including what he described as deceptive conduct from ARCCO regarding the length of Bower’s lease and a request to pay higher rent for the site, which is currently $20,000 per annum. “We regret deeply that the situation has reached this point and that we were unable to achieve a solution together. “As this is an ongoing legal matter we are unable to explain further details of the disagreement at this stage – however we will share as much information as we can as soon as possible, in the interests of accountability to the community we serve. Independent Councillor, Pauline Lockie said that she hopes for a resolution that benefits both ARCCO and the Bower, which keeps the Bower’s sustainability business in the community. “It’s certainly my hope that all parties involved work towards an amicable resolution here because the community has strongly shown that they really value having the Bower there,” she said. The Bower employee Riley Harrison said that the Bower’s services are a necessity for the community and that personal items from staff and customers were now locked away in the premises. Mr Verbist said that legal action will be taken against ARCCO to try to protect staff and customers’ personal possessions which were now in the hands of strangers. Mayor Darcy Byrne has indicated that the council issued compliance order can be resolved without eviction and that he would like to see the Bower stay. Cr Byrne has also offered to facilitate mediation to try to resolve the issue, an offer to which ACCRO is yet to respond.